The nature of the Internet of Things (IoT): Firstly, it acquires information with respect to basic resources (names, addresses, etc) and related attributes of objects by means of automatic identification and perception technologies such as RFID, wireless sensor and satellite positioning; secondly, by virtue of all kinds of communications technologies, it integrate objects-related information into the information network, and realize the intelligent indexing and integration of the information related to masses of objects by resorting to fundamental resource services (similar to the resolution, addressing and discovery of Internet); finally, utilizing intelligent computing technologies such as cloud computing, fuzzy recognition, data mining and semantic analysis, it analyzes and processes the information related to masses of objects, so as to eventually realize intelligent decision and control in the physical world. Therefore, with the influx of masses of complicated objects into the network, the design and operation & maintenance of the application of IoT are confronted with great challenges. Fundamental resources services constitute the foundation of all the application services of IoT, and an effective system of fundamental resources services will become a key link that IoT can not do without in the future. As the fundamental resources of Internet, IP addresses and domain names serve to identify and position the networking equipments in Internet, while related services such as resolutions, management and information retrieval have become the important infrastructure of Internet to sustain all kinds of applications of Internet. Similar to the Internet, IoT also entails objects names and networking addresses as its basic resources in order to realize identification and positioning of the networking objects in IoT. 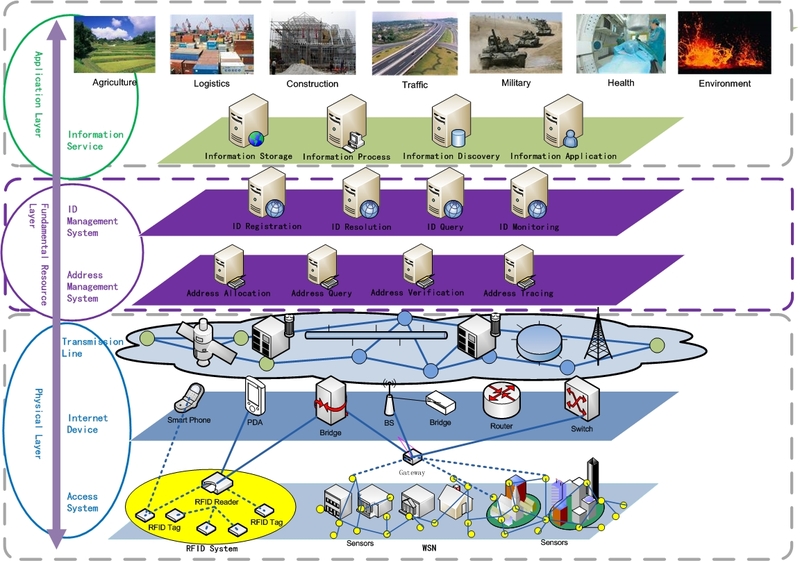 With the continuous circulation of the masses of networking objects in the IoT, information related to the objects will also be distributed randomly globally, therefore IoT has a greater demand for such services as fundamental resources resolutions, management and information retrieval which serve to meet the demand of the IoT applications for information and data related to the fundamental resources of IoT. The research of CNNIC with respect to IoT focuses on the fundamental resources layer of IoT as shown in Figure 1, and mainly studies the key technologies of IoT identification management including heterogeneous identification coding, resolution, discovery and searching.